Highway 12 runs between Lolo, MT, in the westernmost part of the state, straight through the panhandle of Idaho, and into eastern Washington State. And we take that route today, leaving Montana around noon, and crossing the Snake River into Washington around 5. It's 200 miles, roughly, and the first 150 or so are the most beautiful miles I've ever driven. Highway 12 follows the Lochsa River, a trickle for the most part this year, but at one time, a rager big enough to carve out its own bed and the path that Highway 12 follows. 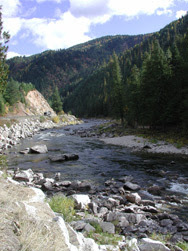 For the first 150 miles, the highway is crowded on the left by the river, and on the right by quickly rising walls of rock and evergreen trees. A sign early on says, "Winding Road, 77 Miles." And it's not a joke. The road meanders through slow left and right turns for its entire distance. Cars run around 55-60 mph for the most part, but the big rolling tin can settles in around 45. And that's fast enough, because each turn brings another gorgeous tableau of water, rock, road, trees, and mountains. We pull over at one of the scores of turnouts and make sandwiches. We stare out the window at the river going past. We continue on, bending, releasing out of the corners, accelerating on the short straight stretches, eyes always cocked up, checking out the mountains that peer down on us. The cell phones are both out, otherwise we'd be calling everyone we know. So, how are things where you are? By the time we hit the small town of Orofino, the landscape has changed. The mountains are hills now. We've left the last of the Rockies behind, for the most part, the towering Bitterroots - the mountains that most vexed Lewis and Clark - the last range for us to blast through at 8 miles per gallon. We stop in Orofino for groceries for the next couple of days. My wife gets a pumpkin, not quite as big as my head, but you get the idea. We're in the Pacific time zone now. The sun is setting already at 5 pm. Highway 12 still bumps around in my brain as I exit onto 5th Street in Clarkston, Washington. We pull in at a campground that overlooks the Snake River and Granite Lake. By the time the sun has gone down, we're into our second bowl of chili. Tomorrow is a work day, transcription day. The tapes are piling up. Then back on the road. Moscow, Idaho. Spokane and Liberty Lake, Washington. Four more days, three more interviews and the October leg will be over.